Dietary supplements in capsules aiding a process of losing weight. 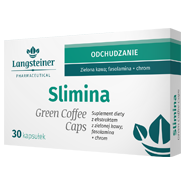 Green coffee: contains chlorogenic acid (ACG), which takes part in slowing down assimilation of sugars, modifies glucose release by a liver and prevents lipid storage in a body. Phaseolamine: influences a stabile level of sugar in blood. It prevents sudden changes of the glucose level (increase and decrease), which results in a feeling of hunger after a meal, aids a process of losing weight, neutralizes consumed starch and thus prevents lipid storage. Chrome: contributes to keeping proper nutritional macroelement metabolism and helps to keep a proper level of glucose in blood. The product cannot be used as a substitute of a varied diet.The product is recommended to adults except pregnant women and nursing mothers. 1 capsule a day after the main meal, wash down with water. A recommended daily dose should not be exceeded.